Avenged Sevenfold are no strangers to holding the top spot, and they came out controlling the crowd from the start. They had a huge stage backdrop, reminiscent of a Dio fantasy, with large steps leading up to castle facades, and three arch ways with huge high definition screens. Showing animation and live feeds of the band members from the stage, the over the top scenery threatened to steal the show from the actual performers, but just barely. 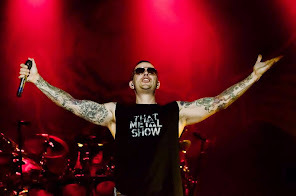 M.Shadows used his vocal prowess to capture the crowds attention, while guitarists Zacky Vengeance and Synyster Gates harmonic precision helped to keep hold. When the band finally touched on “Hail to the King”, the center screen opened up to reveal a towering animatronic Skeleton, complete with crown and sword upon a throne of skulls. A7X made sure that the culmination of a the day was brought on the wings of a nightmare, into the waiting ears of an eager audience.